AEtheline was the only person even mentioned to me despised by both my Aunt Grace and my Father. For both this was expressed not so much in words but as a physicial relation to the mention of her name and their facial expressions. Both were generally kindly people who acted with consideration and charity toward everyone around them. At no other time did I observe such a reaction from either of them. Someplace I have a photo of Dad from his graduation from Stanford. AEtheline is trying to hug him, a gesture which clearly revolted him. Father never mentioned that occasion to me. I just saw the photo. But after he asked me to undertake the job of ensuring Grandfather's legacy was understood and his work credited he answered questions. The answers were always straightforward and intended to dispatch any misconception I had harbored about AEtheline. The best citation of similarity to her behavior is without doubt the evil step-mother in Cinderella. The lurid description in the article to the left provides the impression little Arthur Banfield Deuel was a model of good behavior but provides no sources from the supposed perpetrator of what could have been an intentional injury but also could have been an accident. Notice the date, which is 1906 – February 18 – San Francisco Examiner – SKATING RINK BRUTE TRIPS LAD AND BREAKS ARM Therefore, the event took place before Aetheline had managed to thrust herself to the attention of Arthur C. Pillsbury, who was a romantic who would have been strongly moved by having saved her and her son and various other relations who would soon be entirely dependent on his largess, training for better paying trades, and also for capital to start the businesses their circumstances had made impossible for them. There is not one true statement in the articles to the Right. Three of AEtheline's brothers worked for AC. He trained themin photography and supplied all that was needed to raise their standards of living. Until their went to work for him their employment was blue collar. AC was a generous man who liked to see people be happy and well occupied. 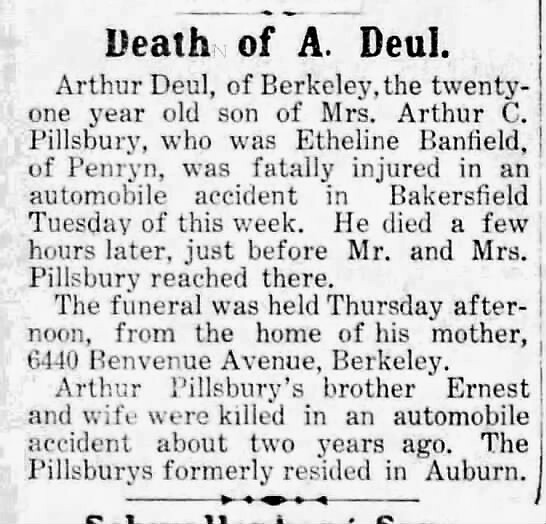 Since the publication in question was well acquainted with the Banfields, the Deuels and especially the Pillsburys, the oddities about the announcement of the death of 'Little Arthur Deuel' requires some explaining. While I was interviewing Father, Dr. Arthur Francis Pillsbury, several things were very clear. AEtheline refused to join in the adoption. 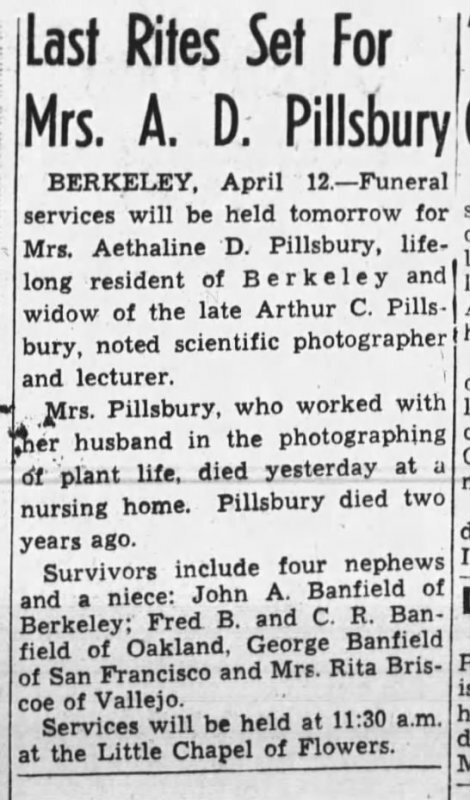 Instead, she insisted on being named as the guardian and receive the money which was to be paid by Title Insurance Company, who grabbed the estate, possible because both Dr. and Mrs. Ernest Pillsbury had died intestate, for herself. This was a condition of allowing him to adopt the children. She in effect blackmailed her husband into paying her to have the children in the home and this for just six months of the year. Additionally, she engaged in predatory behavior in her attempts to obtain property belonging to the children for herself or for her son. This sum would be in the neighorhood of $3,000 a month today. She demanded the children live elsewhere for six months of the year. She demanded Grace's piano, build especially for her, be handed over to 'Little Arthur' so he could acquire another social skill. She demanded Sylvia's jewelry be handed over to her. AC had naturally handed it to Grace as it would have come to her in time. She demanded the three children, ages six, ten, and thirteen, do the housework for her, firing her servants when they moved in. 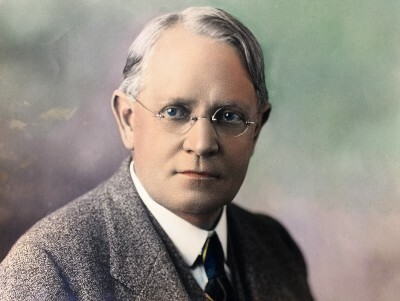 "Little Arthur Deuel' was too busy with his active social life to help out. More on 'Little Arthur's' social life on the Time Line Page and More Arthur Deuel Page for the full articles. I have not yet downloaded all of them, there were more. But 'Little Arthur' was not too busy to bully, push, trip and batter each of the children over and over again. Aethline was well aware of what was happening. Dad told me what a horror it was for them when he was in the house with or without AEtheline present. This came to the attention of AC, who appears to have, forthwith, demanded "Little Arthur" find some occupation for himself. 'Little Arthur' appears to have left the home by late 1913 or early 1914 as he is not longer appearing in the paper. Awareness of what was taking place dawned because Ernie, just 14, ran away from home and took the jewelry with him with the approval of Grace, so he could escape 'Little Arthur's attentions, which fell heaviest on him. She said their Mother would want him to have some money so he could find a job. Which is what he did. Aetheline never changed. She was mawkish and cloying when AC was in the house. When Dad turned 18 he began working his way through Stanford to a PhD. This took him time because he would work a year and then go to school a year. But he never stopped admiring and loving his father, AC. When Dad arrived at AC's home after he died, just a day later, Aetheline had already sold the items needed to begin documenting Grandfather's work. Dad was well aware of its significance and the need to do this. Because of Aetheline it would be decades before this work could start. Dad tasked me with this beginning in 1987. I am still working on finishing the job. Notice that no mention was made of AC's three children, still all living. They were not mentioned when AC died, either. Grace and Dad worked with AC. Dad loved his time in Yosemite. His first job there was sweeping the porch at the Studio in Old Village, this was about the time the Gazebo was built. ​ Dad was a great photographer himself and ran and serviced the mass production post card machine from the time he was 16 until he left for college, and then when he could get back during the summers. Part of 'the deal' was that Aetheline and her family did not come to Yosemite. I suspect AC could only take so much Banfield in his life. Aetheline did not understand the Pillsbury family culture or our values. Dr. Harriet Foster Pillsbury was an advocate for the Rights of women. That was why she became a medical doctor. Aetheline went along with whatever was fashionable, anything to be respectable. Aetheline did not understand AC's parents had no issue with working with their hands. They cleared the land they bought in Auburn themselves an planted their fruit trees. They rebuilt the barn on the land they turned into their home. The Pillsbury family was included in the Blue Book for San Francisco, however. This book was limited to those with elite status. The previous generations of the Pillsbury and Foster families were Transcendentalists and active as Abolitionists and for the Rights of Women. Dad strongly believed it was important his kids understood the value of working with their hands, and we did. I was clearing land for a cabin and assisting with putting in a leaching field for the septic system when I was nine. Aetheline, or Sadie, exhibits the behavior of someone whose goal is social climbing and obtaining the wealth and associations of people with upper class status without regard to the intrinsic meaning these might have if honorably obtained. I saw no sign she actually loved or even cared about her husband. Certainly, her actions say otherwise. Selling off what remained of AC's legacy of work within hours of his death indicates she did not value the thing to which he had dedicated his life. Her refusal to provide the name of the buyer to Father when he arrived soon after this says she did not want her actions exposed to anyone she knew was well acquainted with AC. The buyer was a close friend and associate of AC's who purchased what was offered to keep it from being broken up and sold piecemill. He kept this intact until the end of his life when his widow donated it to BYU, having been told, again, AC had no family who cared about his legacy. This takes us to the next part of the story, the desire of Ansel and Virginia Adams to get their hands on the large collection of photos the collection included. This correspondence is organized to include to letters all relating to A.C. Pillsbury and his work. They all relate to how the Pillsbury Collection came to be located at BYU instead of someplace more appropriate, for instance, Stanford, Berkeley or UCLA. This presentation provides a clear understanding of cause and effect.